San Francisco is a city of the arts. Whether it be dance, theater, music, or almost any other form of artistic expression, San Francisco has inspired and been home to a number of boundary-breaking trailblazers. That legacy is exemplified today by a number of talented women who are the leaders of San Francisco's art scene. Get to know them and their work and discover how you can experience it during your next visit to San Francisco. Born in Mexico, Ana Teresa Fernandez is an award-winning artist whose works span multiple media. 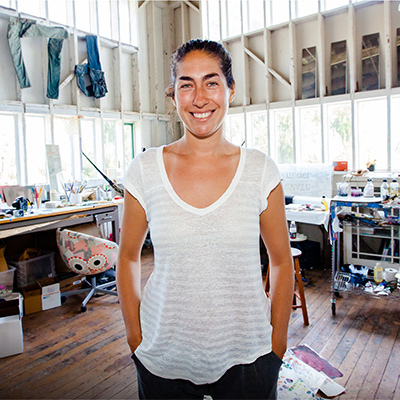 She is a graduate of the San Francisco Art Institute and her works can be seen at Gallery Wendi Norris (8 Octavia St.). Tell us about your art and the institutions you work with. In my studio, I work on issues related to social justice and identity politics. I try to bring awareness to different audiences on subjects that might not be discussed in the media. I have worked with Yerba Buena Center for the Arts quite a bit, and I am now working with Creativity Explored, a non-profit that gives artists with developmental disabilities the means to create and share their work with the community. What about San Francisco inspires you? The landscape inspires me. I live across from the beach in the Outer Sunset. I wake up to a visual conversation with the ocean. I see how much the ocean can change in one day. Similarly, the social landscape inspires me. San Francisco is one of the most diverse cities. It's open to and embraces all identities. Why do you think San Francisco is a special place for women in the arts? I believe part of the social embrace for women is because of how many queer, trans and minority people paved the road for acceptance. I personally see how organizations like YBCA champion women, minorities, and diversity again and again, and find ways in which to create platforms for dialogue and expression. What’s one accomplishment of yours that you’re especially proud of? I am very proud of my 70-foot-long, 18-foot-high, free-standing text sculpture on the east side of Bernal Hill that spells out DREAM. It is located in an area where several freeways converge at the entrance to the city. After five years of working on it, it went up the day after DACA was rescinded and Dreamers were left without possibilities for renewing their status. What started out as a welcome sign into the city became a call to action. In San Francisco, artistic institutions are being led by women in greater numbers than ever before. Nan Keeton is one of those women. Nan's current role is the culmination of a career spent breaking barriers at major artistic institutions across the country. 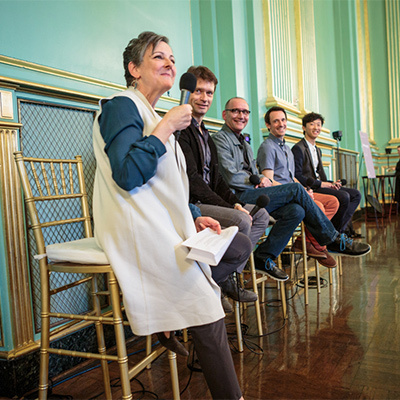 What is your role in the arts community of San Francisco? 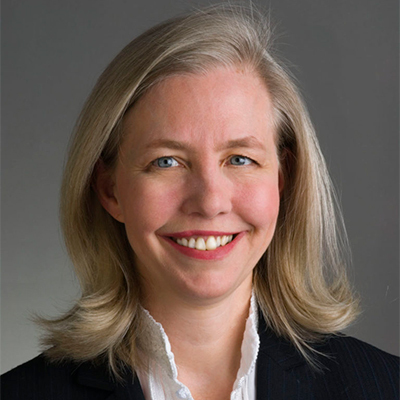 I lead External Relations for the San Francisco Museum of Modern Art (SFMOMA), which includes welcoming over 1 million visitors each year and securing philanthropic community support for our programs. Before I joined the museum, I served as the Director of External Affairs for the San Francisco Symphony. San Francisco’s magic comes from the incredible people, organizations, architecture, and natural beauty that infuse daily life in the city. A visit to any neighborhood will always include an encounter with art, a great bite to eat, and conversations with our residents and visitors. The San Francisco Symphony hired the first woman musician in any American orchestra in 1923, violinist Helen Atkinson. The next year, six more women joined the ensemble. A woman, Grace McCann Morley, founded SFMOMA in 1935. It was the first museum on the West Coast and one of very few dedicated to modern art. These pioneers paved the way and created a space for everyone. I joined the museum staff in 2013, just as the foundation was being excavated for our new expansion. Today, the museum is among the top contemporary art museums in the world, animated with the unique spirit of the city and the Bay Area. It’s a not-to-be missed part of any trip to San Francisco, and I am especially proud of that. Creativity can be found everywhere in San Francisco, even in the city's world-famous tech sector. Audrey Liu is a veteran product designer for Lyft who manages multiple design teams. In her work to define and improve the user experience, Audrey regularly calls upon the artistic inspiration she finds in San Francisco. I draw a lot of my inspiration from diversity and nature, both of which are reasons that I love San Francisco. You're constantly confronted with different perspectives, intelligent debate, and new ideas. As for nature, it's amazing to be able to access such beauty so easily. It's completely magical to walk along our beautiful coast or amongst our towering redwood groves. Why do you think San Francisco is a special place for women in creative fields? San Francisco has a history of being the epicenter and originator of major social movements. That history and the general culture of challenging how we all think about traditional paradigms has created a unique environment where you're more willing to take risks, to be wrong, and to be okay with it. Early in my career, I designed an app called Unstuck. It was a tool to help anyone work through an issue that had them stuck, from wanting to lose those last ten pounds to wanting a new job. It was a risk to design an experience that was so out of the norm, but it was received really well and won multiple awards. One of the great benefits of art is the community it fosters. Andrea Yannone has held leadership positions with two of the most prestigious performing arts companies in San Francisco. Her work continues her personal mission to bring art out of the theaters and concert halls and into the lives of people who might otherwise never have access to it. After ten years with the San Francisco Symphony, I’m now in my fourteenth year with San Francisco Ballet, currently serving as Director of Education and Training. I’m inspired by the neighborhoods and the celebrations of world cultures that many neighborhoods and communities present. I’m inspired by the people of San Francisco. Walk down any street and you’ll find someone who is from somewhere else and you know that there’s a story behind them. Women are important influencers in the arts scene here—as art-makers, arts administrators, and arts patrons. I’ve noticed a sisterhood of women in the arts who support and uplift each other, which is exciting and builds a sense of community. More and more women are in positions of power—not only in arts organizations—and they're taking a stand in support of the arts. I’m very proud of the work my department has done over the last four years to expand SF Ballet’s education programs and SF Ballet School initiatives. Our programs serve nearly 35,000 adults and kids in the Bay Area annually. We have expanded our reach in the community to include dance classes for adults with Parkinson’s Disease and kids who are on the autism spectrum.